Friday, November 22nd, 2013 | Author: Bunco Betty! Some groups have 12 core players with subs who fill in for those who cannot attend. My group has 60+ members and typically we have between 18-24 players. We rarely play with a multiple of four players, so we more often than not have at least one ‘ghost’. A ghost is an empty seat, or invisible player whose ‘partner’ plays for them. At our last game we had three ghosts (yes I know some of you are cringing at the thought of this!). It is nice when there are enough players but a ghost (in my opinion) is not that bad. It really just means that someone at the table has to roll every other time. In our group whoever is the ghost usually does not keep score (unless they want to). 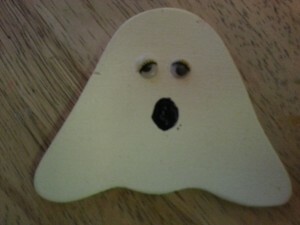 The husband of one of our players made us small wooden ghosts (see photo). They are easy to carry from table to table and it lets us know that there is indeed a ‘ghost’ playing at that table. I have played with other groups that use a baby doll or nothing at all to stand in for the ‘ghost’. Do you play with a ghost? Do you always have 12 players or a multiple of four playing? If so, how does it work? Do you use substitutes? My group has never used substitutes. I am not even sure how it would work. If your group uses subs, let me know how it works on The Bunco Game Shop’s Facebook Page.